On Saturday morning, the U.S. will take a key step toward restoring its capability to launch astronauts from its own soil when a SpaceX rocket blasts off from Cape Canaveral, Florida. Why it matters: Returning launch capabilities of astronauts to U.S. soil for the first time since the Space Shuttle program ended in 2011 will mean that NASA will no longer be dependent on Russian rockets for hitching rides to the Space Station, at a cost of about $75 million per seat. The reliance on Russian rockets has worked for NASA, but it's not an indefinite solution. The big picture: The launch at 2:48 a.m. Saturday signals a passing of the baton from government-led space missions to public-private partnerships, in which billionaires like Elon Musk, who founded and leads SpaceX, will share the credit for U.S. space exploration. This will be the first time a privately-built spacecraft designed to carry astronauts will launch to the space station. Beginning later this year or early next, U.S. astronauts and their cargo will hitch a ride to the International Space Station (ISS) on rockets built by private companies. Details: During the 6-day mission, SpaceX's Crew Dragon will attempt to dock autonomously with the ISS, thereby testing most of the capabilities of the crew transport system. The demo launch is part of NASA's long-delayed Commercial Crew program, under which a combined $6.8 billion in contracts has been awarded to Elon Musk's SpaceX and Boeing to launch astronauts and cargo to the ISS. The contracts amount to $4.312 billion to Boeing so far and $2.5 billion to SpaceX, according to NASA. Though no one will be riding in the capsule on Saturday, it will include a dummy named "Ripley" (in homage to "Alien") containing sensors that will allow SpaceX and NASA officials to get a better idea of what a person would be exposed to in terms of G-forces and radiation. Boeing will test its CST-100 Starliner vehicle in March. The test flights are steps toward certifying the safety of these companies' spacecraft before crewed test flights. Yes, but: Before they can launch humans into space, SpaceX and Boeing must meet strict safety requirements, including limiting the risk of loss or permanent disability of crew to at-or-below a 1-in-270 chance. Such a standard is more stringent than those used for NASA's Shuttle program. Difficulty in meeting the loss of crew requirement, as well as design and production challenges, have led to considerable delays in the Commercial Crew program, so much so that NASA had to consider contingency plans to maintain ISS access in the event neither Boeing or SpaceX is ready to launch safely. The demo-1 flight is expected to reveal some flaws in the SpaceX system in order for them to be fixed, NASA says. NASA is hedging its bets against the possibility of further delays by considering the purchase of two additional Soyuz seats in 2019 and 2020, Space News reports. What to watch: NASA is overseeing and certifying these companies, but is now taking on the role of supporting player. But this doesn't mean NASA will fade into the background, says Eric Stallmer, president of the Commercial Spaceflight Federation, which promotes the development of the commercial space sector. "NASA is an iconic brand and is going to continue to do incredible things," Stallmer tells Axios. He says that SpaceX, Boeing and other private spaceflight company logos may be viewed with a similar reverence in the future. "We're a commercially-minded nation," he says. He called it "a national embarrassment" that the U.S. has gone about 8 years without the ability to launch its own astronauts. What's next: An in-flight, uncrewed abort test will take place after the demo-1 mission. 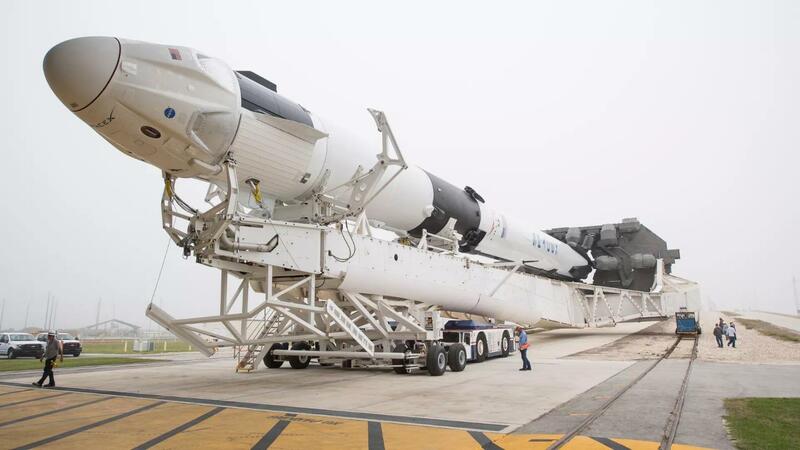 Assuming all goes smoothly and the company meets certification requirements, then the first crewed SpaceX test flight to the ISS, with astronauts Bob Behnken and Doug Hurley on board, could blast off as early as July. The Boeing timeline is proceeding at roughly the same pace, as well.